He could return to the top flight in 2020 if there are circumstances to try to win the third title, something that the French and Lauda have already done and tried four other champions. A dream, the third title. A goodbye. Or so ... A possible return. Fernando Alonso will not be in F12 this year but he may return in 2020, before six other champions did. Lauda and Prost won again. The Asturian genius and its road map. Dreams, who knows? Someday they could travel to the universe of reality. This is the story of those who tried it and of those who succeeded. He won the 1980 championship and a year later he finished third in the World Championship with Williams. However reappear in the Western GP of the United States with an Arrows, but retires tired. He returns with 39 years with a Lola from the Haas team, retires in three races in 1985 and finishes four in 1986, although with a fourth place in Austria. An abandonment in Australia is his final farewell. Volar. Money. The conjunction of these two words coincided in the dream of Niki Lauda ... and in his return to F1. And is that the Austrian had left the championship in 1979, together when he did James Hunt, to create Lauda Air, an airline in which he spent all his money and for which he needed to expand capital. Where could I go? Of the F1. So Lauda came back with McLaren, won the third race, and in 1984 he won the title with half a point on Prost (in Monaco he played half a race and gave himself half the points), which also returned that year. He retires in Australia 1985. Ferrari and a truck, two concepts apparently so contradictory that caused the fulminating dismissal of Alain Prost of the Italian team in 1991. And is that the comparison of his F642 with a truck was a humiliation that the team more Legendary always could not stand and was replaced by Morbidelli for the final grand prize of the season in Australia. But the story of The Professor in F1 would not end like this. After a sabbatical, he returns with the Williams team and a clause: he did not want to have Senna on the team. Prost dominates the championship with an incredible car and wins his fourth title. But someone said that he always wins a champion, but he does not always win the best. In 1994 the clause ends, Senna signs for Williams and the Frenchman has to leave the F1 ... and the Paulista loses his life in Imola. He was not a friend of Prost, let's say it like that. Nigel Mansell left Williams the same year he was champion, in 1992. He did not reach an agreement with Sir Frank, on the one hand was Alain's partner with whom he had not gone very well in his time as Ferrari, on the other his pretensions and the fact that a certain Ayrton Senna had said he was willing to run for free with Williams. At the last minute they tried the agreement with a final offer that the Briton did not want to consider. So he went to the IndyCar and won the championship although not the Indianapolis 500, was third in the victory of Emerson Fittipaldi. In 1994, at the age of 40, he returned to Williams as Damon Hill's partner in the last races after the Senna tragedy and won the last race of the year in Australia. In 1995 card by McLaren, but ... it did not fit in the car. It took a few races to retire. Dos. A call from Ross Brawn and a car that took longer than expected to be ready. Those two circumstances were the culprits that Michael Schumacher returned to Formula 1 and that his return was not a success. Respectively. After his seven world titles and five consecutive with Ferrari the German is dethroned by Alonso in 2005 and especially 2006, year in which they fought practically in equality of cars. He decides to retire. In 2009 after Massa's accident in Hungary is about to replace the Brazilian, but finally does not. It is in 2010 when Mercedes makes him an offer that he could not refuse, an important salary and the suspicion of a winning car. Michael will help build it, the glory will be for Hamilton and Rosberg. 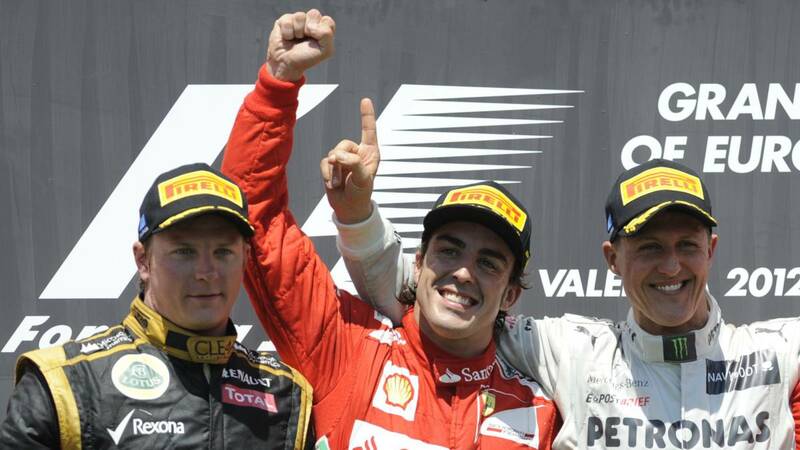 He achieved a podium in the unforgettable Valencia 2012 race, along with Alonso and Raikkonen. It was not done to the Pirelli. In 2013 Mercedes makes some illegal tests, the Italians change their tires and start to win. But Michael had already retreated definitively. At a press conference in Japan, on the verge of tears ... with Ross Brawn at his side. His last big prize was Brazil 2012, seventh. That year ended on the thirteenth, thirteenth. Now he is still struggling to return ... to normal life. In 2007 he achieved the title ... of McLaren. But the following year Kimi Raikkonen can no longer with Lewis Hamilton and in 2009 he faces a poor Ferrari and especially the threat of Fernando Alonso. Iceman gets a good compensation from the Scuderia so that the Spaniard can get behind the wheel of the red car and the Finn goes to have fun at the World Rally Championship or the Nasca, but in 2012 receives the call of Lotus after filtering with Williams and finishes third in the World Cup with a victory in Abu Dhabi and seven podiums, the following year also wins in Australia and should spend five years until his next victory, in the United States with Ferrari He competed one year with Alonso in the Italian team and Spanish almost tripled in points. In 2019 he will drive for Alfa Romeo Racing, a former Sauber team with which he debuted in 2001.